There my favourite bark aswell.. Thanks for the lovely comments girls, the Birches are fantastic this time of year aren't they. If you look close at the bark, there seems to be views of white water rapids! If only Sticki!! My one Birch tree which I was sure was the pendula, is just the ordinary one....:o((. Yes do Sheila, shall look forward to seeing it. Will give it a try, but not sure I'd want to show my feeble attempt . . . Yes do Sheila , we would love to see your painting .. Yes, beautiful shot! Autumn yellow and deep orangey pyricantha sprinkling across! Fav! They grow so tall though Amy, these are at Normanby, the one in our garden must be nearly 20ft, planted 4 years ago, we need to take the top out too, to fit the garden. Have to do a Christmas card first, Janey, unless I can think of a way to make this "Christmassy"?! Love these birches. Have been thinking of having a go at growing some from seed. I noticed that there are some advertised in the Chiltern seeds catalogue. Anybody tried growing trees from seed? Hi Angela, I have a friend who has grown a Metasequoia from seed from the Chiltern catalogue - it is now 20ft tall! I've tried Acers, but they are Very Slow . . . Someone once told me that trees grown in warmer climes germinate more quickly. Wow Sheila, clever you! Will the Xmas card be a painting that you'll copy as cards? You could use this an slap some snow up the side of the birches and dripping off the leaves, add robin of course....maybe you could do it all on the computer? Have you got photo shop? 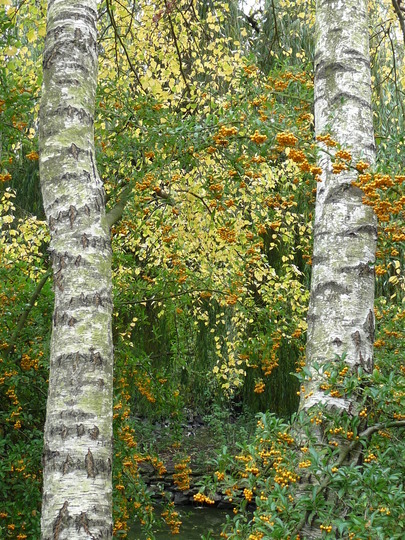 Hi Angela, the birch tree in my garden was from a seed of our original birches at our first house. They grow quite easily naturally, in fact I'm often pulling seedlings out. My tree was one I trained as a Bonsai, then when we moved I gave it to Mum, who hates Bonsais, and she tipped it out into her garden. There it grew for 6 years until we retrieved it again and brought it to this garden. I'm a bit disappointed that it's not the pendula one though. I would always go for that type. That's interesting Sheila, I suppose it all depends on the type of tree too Birches are quite easy and quick growers. Janey, yes, I usually do a painting, then have it miniaturised (if necessary) and printed onto card at Prontoprint. I don't even know if I have photo shop - am not very good on the computer!! Btw, I didn't know birches were easy from seed - might try that. I have 2 or 3 Ash bonsai from seedlings found in the garden. See who else is growing Betula pendula (Silver birch). See who else has plants in genus Betula.